I believe this is one of the last photographs of the Hood River Delta before it slipped under Lake Bonneville. That jetty road continued to provide access to the marina and the river until the Army Corps of Engineers got to work in 1962 constructing the current waterfront. The delta returned of its own accord with two major flood events. 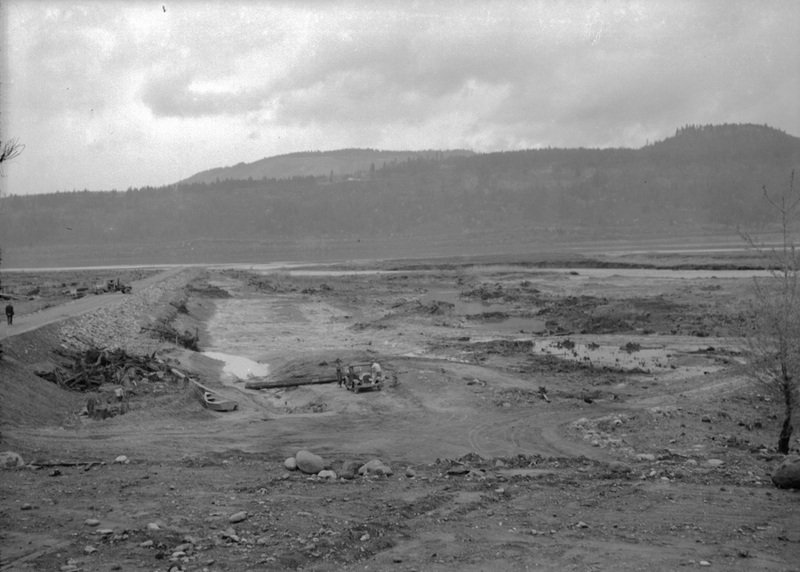 In 1996 a large amount of material came down the Hood River to lay the foundation for the new delta. In 2006 another flood event brought it to the surface. I'll be talking about the history of this spot as part of tomorrow's Sense of Place lecture. I'll be joined by Lorri Epstein and Carina Miller. We'll each provide a different perspective on the spot now known as "Nichols Basin." You can get full details and order tickets here. Arthur, was the jetty road the same as "the mole"? If so, how did one access it from downtown during the 40's and 50's? This is something I've been trying to remember since returning to Hood River after many years away. So, was all of this a natural delta where they cut down the cottonwood trees and leveled out the sand? That rowboat looks high and dry.